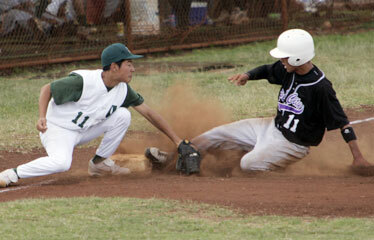 Pearl City's Rorry Nakayama stole third base against Aiea's Jared Iwane yesterday. With a big performance on the mound and a "little ball" approach at the plate, No. 9 Aiea knocked off third-ranked Pearl City 5-3 yesterday at Aiea Recreation Center. Right-hander Randy Castillo limited the Chargers to five hits in a complete-game win as Na Alii improved to 5-0 in the Oahu Interscholastic Association's West Division, keeping pace with Mililani (6-0). Pearl City fell to 4-1 and will try to rebound for a matchup with Mililani on Wednesday at Central Oahu Regional Park. Castillo, a hard-throwing 6-foot-2 junior, kept the Chargers off balance by mixing a biting curve and slider with his crisp fastball. He struck out six, walked five and benefited from two double plays. "I tried to just do what I do every game, just let my defense work," Castillo said. His pitch count topped out at 121, and he said he felt he "could have gone two more (innings)." "I'm proud of his performance not because he won or he pitched well, but he had to overcome a lot to get to this point," Aiea coach Ryan Kato said. "He had his hiccups along the way and he overcame it and now he's focused and now he's starting to see what good things happen when you stay focused and you do everything right." Aiea's philosophy revolved around pitching and defense to give a scrappy offense a chance to scratch out runs, and Aiea was able to manufacture just enough support for Castillo yesterday. Ricky Itagaki, Aiea's 5-foot-4 ninth-place hitter, epitomized Na Alii's emphasis on execution and was involved in three runs without getting the ball out of the infield. With two out in the second inning and Aiea's Brenan Sato on second, Itagaki pushed a bunt to the right side of the infield and beat Pearl City pitcher Bryson Nakamura to first. With Nakamura diving to the bag to try to get the out, Sato made the turn around third and slid in safely for Na Alii's first run. Itagaki then scored on Casey Yara's double to left and Cody Aquino followed with a single to center to give Aiea a 3-1 lead. In the fourth inning, another perfectly placed bunt by Itagaki -- who was facing a full count -- brought Ryan Murakami home on a safety squeeze. Two batters later, Aquino's sacrifice fly scored Tyler Abisal to cap Aiea's output. "We don't have a very potent offensive lineup, so instead of trying to get them to hit the ball better, we just focused on the things we're good at, which is defense and pitching," Kato said. "We're really hard on them, especially in the bunting game and with the way we run the bases. We're meticulous in that point because we know we're not going to have three-run homers." Bryson Nakamura, Kurt Poentis (6) and Carlton Tanabe. Randy Castillo and Anthony Tsui. W--Castillo. L--Nakamura. Leading hitters--PC: Ryno Acosta 2b, RBI; Nakamura 2-4, 2b. Aiea: Casey Yara 2b, RBI; Cody Aquino 2 RBIs; Tsui 2-3. Leilehua 14, Waialua 1, 5 inn. Brett Nakasone struck out six and didn't issue a walk over four innings to lead the Mules over the Bulldogs. Brett Nakasone, David Navarro (5) and Ehukai Woolley. Arthur Hernandez and Lokahi Herrod. W--Nakasone. L--Hernandez. Leading hitters--Lei: Edison Dumlao 2-3, 3b, 2 RBIs; Darren Baccay 3-4, 2 3b's, 2 RBIs; Bronson Smithe 3-4, 2 RBIs; Corey Yamaguchi 2-2. Wail: Shayne Peiler 2-2, HR. Barak Holt homered and drove in two runs and four Seasider pitchers combined on a one-hitter as Waianae rolled past the Rams. Radford's Matt Tsuneda broke up the no-hit bid with a single in the bottom of the seventh inning. Aina Kalaola-Meyers, Bud Pickering (4), Dane Tabangcura (6), Quintin Tiatula (7) and R.J. Tacgere-Bailey, Nalu Hachio (5). Kyle Blair, Dominic Caggiano (5) and Zach Feitz. W--Kalaola-Meyers. L--Blair. Leading hitters--Wain: Barak Holt HR, 2 runs, 2 RBIs; Ben McQuown 2-4, 2b, 3b, 2 RBIs; Ernest Stevens-Sadamuiu 2b; Pickering 2b, 2 runs. No. 5 Mililani 20, Nanakuli 2, 5 inn. Jose Cruz drove in four runs and John Abreu added three RBIs as the Trojans rolled over the Golden Hawks to remain undefeated in league play. Jay Yoshizawa, Joey Aquino (4) and Richie Mariano. Lanson Koko, Ritchie Roza (3), Brandon Marsil (4) and Lalo Respicio. W--Yoshizawa. L--Koko. Leading hitters--Mil: Jose Cruz 2-4, 2b, 3b, 2 runs, 4 RBIs; John Abreu 1-3, 3b, 2 runs, 3 RBIs. Nan: TJ Huffman 1-2, 2b, RBI. Aaron Santiago, Michael Kahalehoe and Oliver Taoy each had two RBIs in the Hurricanes' victory over the Sabers. Allyn Oliva-Respicio and Cameron Howser. Oliver Taoy and Kalani Omoto. W--Taoy. L--Oliva-Respicio. Leading hitters--Camp: Oliva-Respicio 2-4; Kia Kapana 2-4, RBI; Bronson Ellis-Rivera 2-4, 2b, RBI; Christian Marquez 2-3, RBI. Kapo: Curtis Donald 3-3, RBI; Aaron Santiago 3b, 2 RBIs; Michael Kahalehoe 3b, 2 RBIs; Kyle Dela Cruz 2-3; Taoy 2b, 2 RBIs. Josh Horikawa, Jordan Monico and Jay Yoshizawa hit consecutive doubles in the fifth to give Na Menehune the lead, and relief pitcher Jordan Hirata came on to record the save for Moanalua over the Cougars. Toby Inouye and Bryce Marcoullier. Kenson Miyaki, Jordan Hirata (6) and Chris Liu-Saguid. W--Miyaki. L--Inoue. S--Hirata. Leading hitters--Kais: Toby Inoue 2b; Michael Kawashima 2-3, 2b. Moan: Jared Coloma 2-3; Jordan Monico 2b, 2 RBIs; Jay Yoshizawa 2-3, 2b, RBI. Kailua 35, Farrington 2, 5 inn. Kenny Ellis went 5-for-5 with a home run and six RBIs to lead the Surfriders, who scored 30 runs in the first three innings. Jared Tamanaha and Raynor Yokoi, Jordan Limahai (4). John Kim, Allan Lumansoc (1), Brysn Segundo (4) and Paul Manligot, Segundo (2), Diamond Pedro (4). W--Tamanaha. L--Kim. Leading hitters--Kail: Zach Akamine 2b; Kale Sumner 2b, 3 RBIs; Jackie Uemoto 2 2bs, 2 RBIs; Jared Iha 3-4, 2 RBIs; Limahai 2b, 2 RBIs; Kenny Ellis 5-5, 3b, HR, 6 RBIs; Marcus Matthews 3-4, 2b, RBI; Kili Vierra 2b, RBI. Roosevelt 19, Kaimuki 2, 5 inn. Keoni Manago and Nick Dang each tripled during a five-run first inning and the Rough Riders scored at least twice in every inning to defeat the Bulldogs. Nick Wong, TJ Bae (3) and Tyler Nitahara, Cal Sumida (4). Daren Muramoto, Ian Delizo (3) and Delizo, Muramoto (3). W--Wong. L--Muramoto. Leading hitters--Roos: Keoni Manago 3-4, 2b, 3b, 3 runs, 2 RBIs; Nick Dang 3b, 2 runs; Kelson Okimoto 2b, 2 runs. Kaim: Muramoto 2b. Castle 13, Kalaheo 3, 6 inn. Lyle Kitagawa tripled and drove in four runs and Codey Cabael, Kris Kahanu and Kainoa Tom combined to hold the Mustangs hitless over six innings to lead the Knights to victory. Codey Cabael, Kris Kahanu (4), Kainoa Tom (6) and Lyle Kitagawa. Richard Preza-Haynes, Jordon Hugo (6), Kyle Okumura (6) and Cody vonAppen. W--Cabael. L--Preza-Haynes. Leading hitters--Cast: Tom 2b, 2 RBIs; Brandon Gross 2-3, 2b, 2 runs; Kitagawa 3-5, 3b, 4 RBIs; Trevor Okumura 3-4, 2b; Cabael 2-2, 3b; Joshua Serrano 3-4, 3 runs; Kahanu 2-3. Kalh: vonAppen 2 runs. Kalani 14, Kahuku 1, 5 inn. Chris Pieper and Ridge Carpenter each had three hits for the Falcons, who romped past the Red Raiders. Shamus Kumashiro and Jason Lee. Steven Van Ness, Kevin Van Ness (3), Ikaika Sasaoka (4) and Sasaoka, K. Van Ness (4). W--Kumashiro. L--S. Van Ness. Leading hitters--Kaln: Ridge Carpenter 3-4; Chris Pieper 3-4. Hali Puero blasted a three-run homer as part of a nine-run third inning for the Cougars, who held on to beat the Dragons. Damien Bentosino, Kawika Haili (5), Blaine Pilayo (6) and Kaeo Schweitzer. Keala Freitas, Ike Shigematsu (3) and Josh Umeda, Mana Meyer (3). W--Bentosino. L--Freitas. Leading hitters--Kea: B. Pilayo 2-5, run, RBI; Rodney Pilayo 4-5, 3 runs, RBI; Hali Puerto 2-4, 3b, HR, 4 RBIs; Kendrick Gouveia 2-3, 2b, run, RBI. Hon: Kahale Artuyo 3-4, HR, 3 runs, 2 RBIs; Shigematsu 2 RBIs; Mika Nickel 3b; Hao Correa 3b; Christian Cook 1-3, 2b, RBI.